At last, my long awaited journey to Italy with my mom. What an amazing experience. I think I could go to Italy a million times and not do the same things twice: once just to take photos, once just to study art, once for fashion…and of COURE once (or more) just for the FOOD!!!! 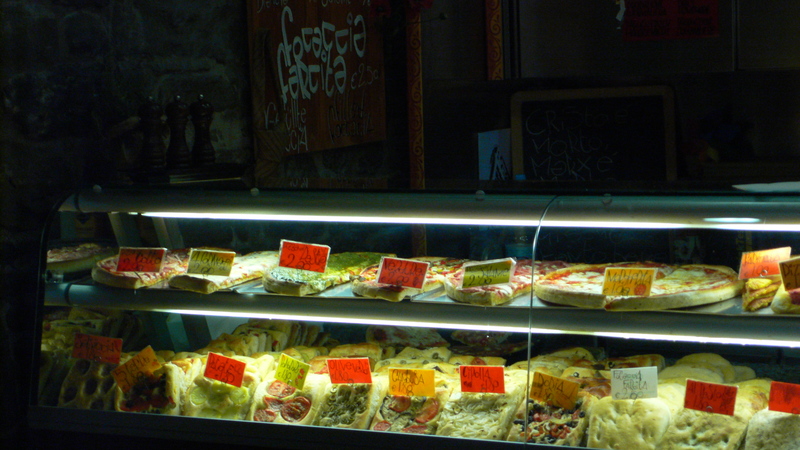 There is no end of opportunities to experience the Italian Palate. Streetside bars (aka cafe’s), fine dining, quaint little corner markets with fresh produce spilling out into the streets, it just never ends. The food, in a word, is fabulous, although I did not find not ONE specific off-white delectable during my travels. Thank goodness I don’t need to eat gluten-free, or I think I’d be in trouble. The Italians have mastered the art of eating bread and cheese on a regular basis and balancing it with healthy doses of walking, climbing stairs and laughing to offset the nutritional challenges of such a diet. There is so much to post about, I think what I’ll do is take you on a bit of a journey as it happened for me, with the pics and videos interweaved. It might just have to be more than one post, as I did spend much of my time and my film on off-white impressions and insights. So many good memories made that involved food and the culture of food. So, let’s begin…. INSIGHT #1: Learning what it means to have ‘enough’: This lovely pic exemplifies what became a typical breakfast for us: a coffee and a breakfast pastry. Yes, I did have white flour pastries for breakfast. Interesting phenomena: when the portions are small and the food is relatively expensive, the need for excess totally diminishes. 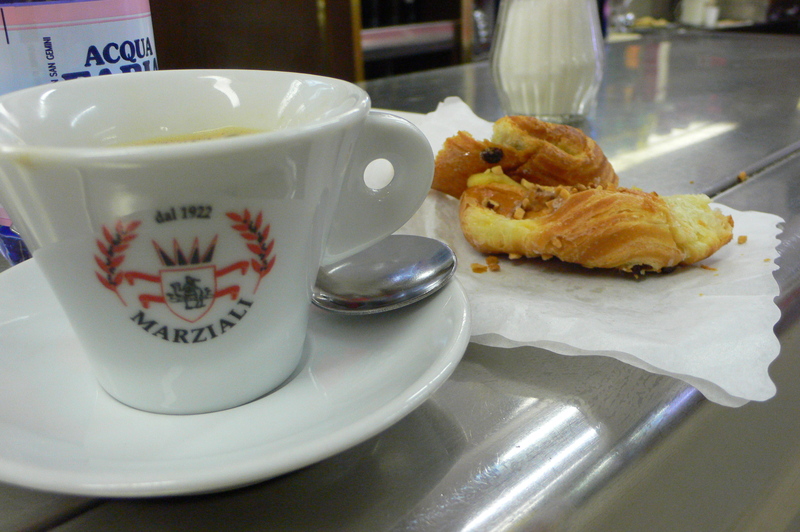 Everything in Italy appears to be done with care, even the simple serving of your tiny coffee and breakfast roll. The sounds of the dishes clamoring, the smell of the coffee brewing – all of it helps nourish the soul so that the meal is appreciated. I related to my food more in Italy than I normally do, and found myself easily leaving 10-20% of my meal on the plate because I could connect with the notion of ‘enough’…… fabulous feeling, and more satisfying than any flavor is the sense of giving yourself just what you need and nothing more. ON EATING LOCAL: one of my favorite things to do when I travel is to find the local markets and buy my fresh fruit and veggies for snacking on during the day. 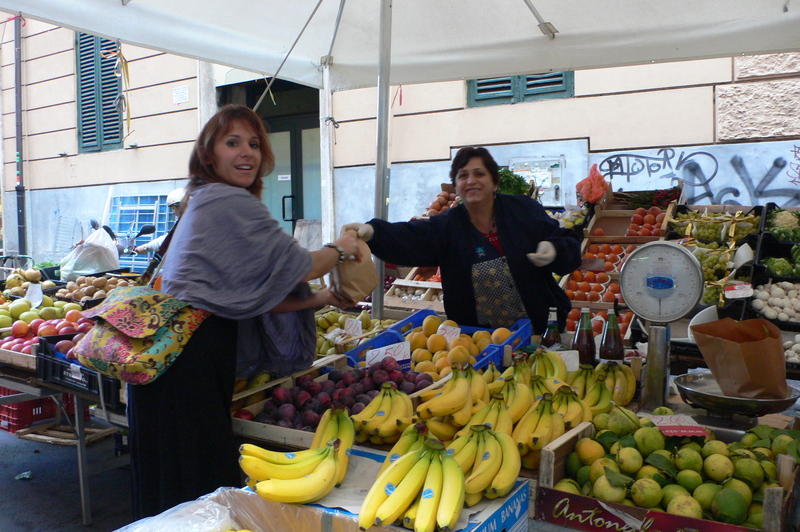 This impromptu market sets up a few days a week near the hotel we stayed at in Rome. The woman helping me was sweet and good humored as I fumbled with my Spitalian (spanish and italian blended together) to buy some bananas, apples and pears for the day. The produce was incredible, much like what we get on the west coast, but the pears were far superior – crisp, sweet and oh so fresh!! 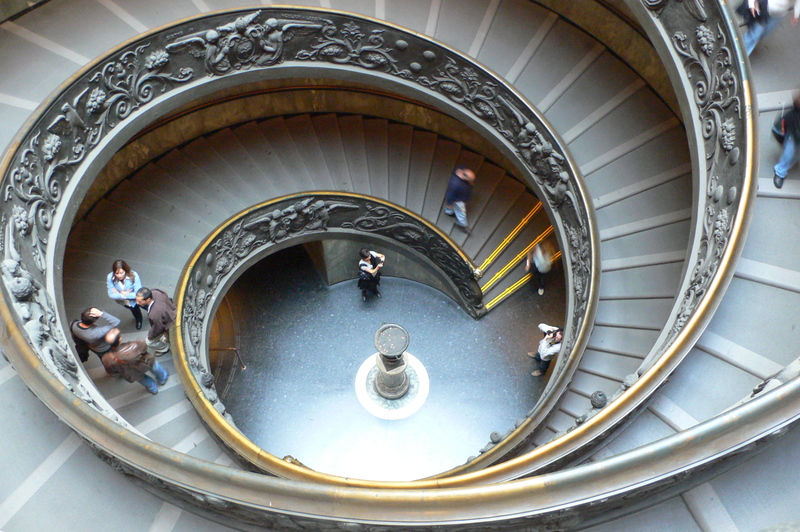 ON LIFESTYLE: this is the exit from the Vatican museum. There may have been an elevator somewhere, but mostly this is your way out. Young and old alike must make their way down the spiral. It seemed that there was no shortage of opportunities to walk and go up and down stairs in Italy. How amazing to see elderly folks moving up steep hills, spiral staircases and generally speaking just walking around. I was once again reminded of the power of moving the body and how little we do in the US. Mostly we find ways to avoid moving. Our public places are more and more providing ways for us to avoid moving. 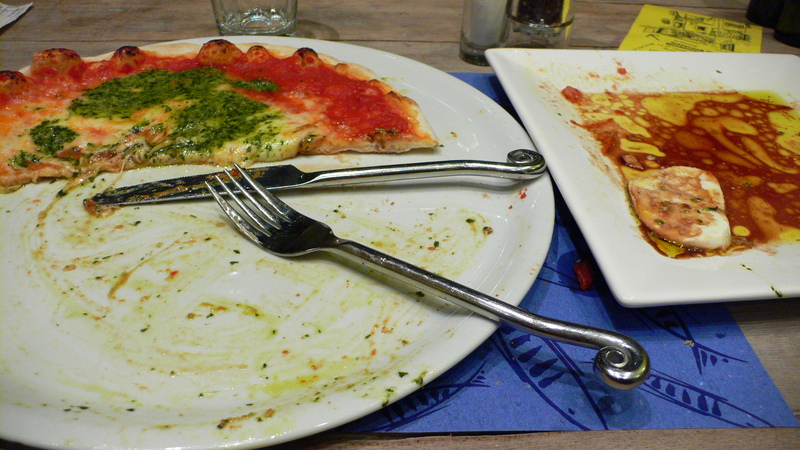 ON SHARING: never have I felt so satisfied as when I finished half of this amazing Pesto pizza (WITH CHEESE) and Caprese salad (is there such a thing as too much mozzarella??) and then giving the second half to a group of young travelers on the train back from Monterossa (Cinque Terre) to Riomaggiore. It would have been really tempting for me to just devour the whole dang pizza, as I was immensely hungry by the time we ate that night. 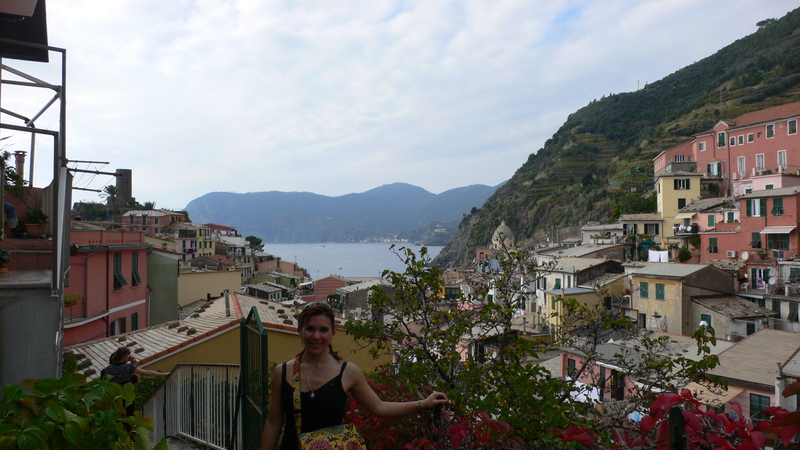 We’d hiked the Cinque Terre that day, which took us 6 hrs to get from Riomaggiore to Vernazza, and we cheated by taking the train to the 5th town, Monterossa. But, tuning into my body’s sense of satisfaction left me with something to share. This was THE BEST pizza of my whole life, and only cost 4 euro (by comparison we sometimes spent 3.80 Euro on a cappuchino). ON EYE CANDY: no, not me…the town! 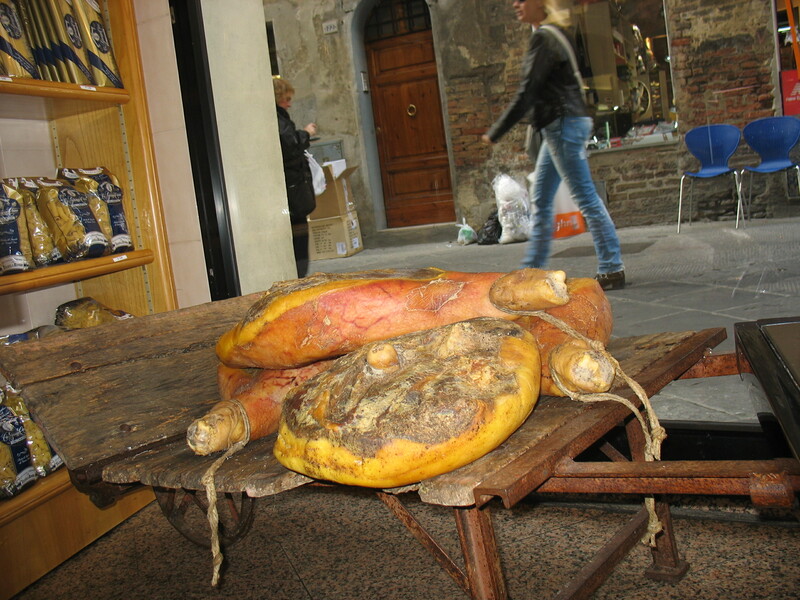 Italy was full of ‘feasts for the eyes’. It seems like Italy does everything in an artful way, even the haphazard layout of these hillside towns becomes beauty. 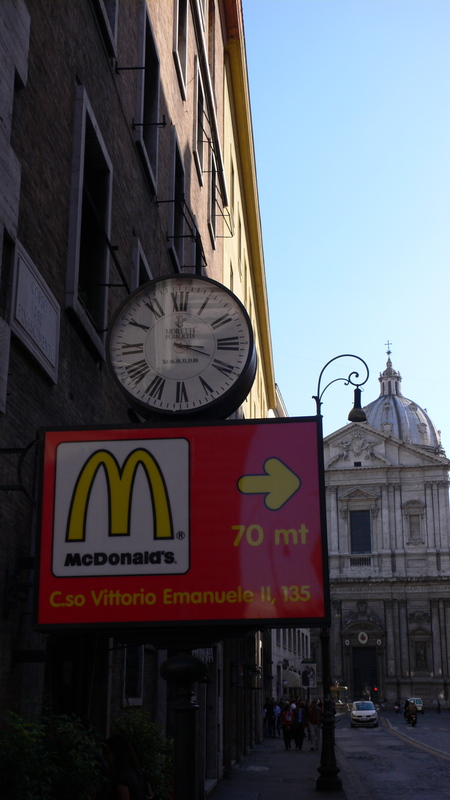 I love it how the Italians don’t seem overly obsessed with making things Uniform and unnatural. The environment was anything but sterile. It reminded me that perfection comes when we allow the realness of something (or somebody) to come through and express its true nature. I feel it is this that made me personally feel so at peace during my trip. I did not obsess on ANYTHING (and that is saying a lot for me because I’m somewhat of an obsessive person), not even what I was eating. Funny thing is, as I let go and just allowed my true nature to unfold, my portions were balanced, my choices were balanced, and I managed to lose a fe pounds, despite eating just about whatever i wanted (can we day ‘daily gelato habit’??). Ah…so this is the secret of the mediterranean lifestyle……. 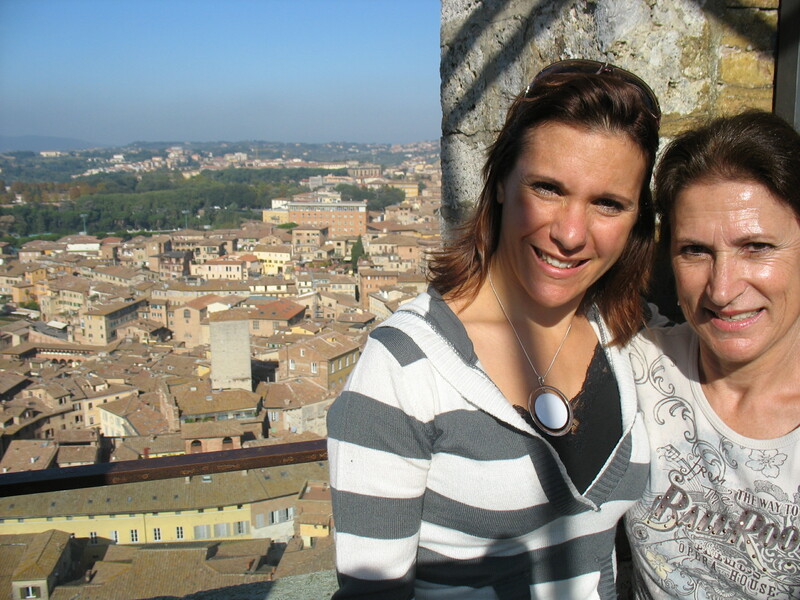 ON SHARING THE WHOLE THING WITH MY MOM: like a good meal, I believe that most good travels are meant to be shared. It was magical to spend this much time with my mom – something I hadn’t done since I moved out 14 yrs ago. She proved to be an amazing travel partner and totally up for the adventure, whatever that meant for the day. Like this day, for instance, which include a spontaneous journey up a 400 stair tower in the city center of Siena, Tuscany. The reward was amazing 360 views of the city and countryside around us…breathe-taking. She was also willing to put up with my never-ending desire to take pictures of food and make videos about food. She even took one for the team now and again with her willingness to be the silly tourist – snapping photos of gelato, pointing out fruits stands that would make for nice photos, and letting me document her endeavor to find a cup of coffee that measured up (in volume and taste, but mostly volume) to what she got at home. I feel blessed to have share the journey with her…..
More to come next post.